Auto-destructive art is primarily a form of public art for industrial societies. Self-destructive painting, sculpture and construction is a total unity of idea, site, form, colour, method, and timing of the disintegrative process. Auto-destructive art can be created with natural forces, traditional art techniques and technological techniques. The amplified sound of the auto-destructive process can be an element of the total conception. The artist may collaborate with scientists, engineers. Self-destructive art can be machine produced and factory assembled. Auto-destructive paintings, sculptures and constructions have a life time varying from a few moments to twenty years. When the disintegrative process is complete the work is to be removed from the site and scrapped. acid on nylon. South Bank, London, 1961/1966. 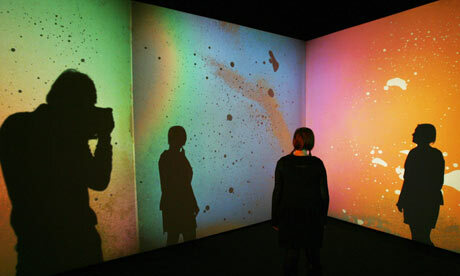 In 1959 Gustav Metzger began spraying hydrochloric acid onto sheets of nylon as an 'auto-destructive' artistic act. These 'paintings' often lasted only a few seconds, creating rapidly-changing holes in the material which disintegrated under the effects of the acid, before totally disintegrating. After the works were completed the supports and remnants were scrapped. 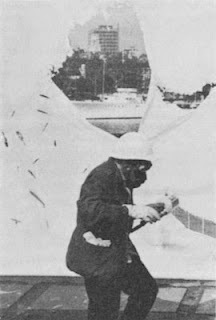 The term Auto-Destructive Art was coined by him around this time and cemented in an article of 1962 entitled Machine, Auto-Creative and Auto-Destructive Art, in the art journal Ark. Initially conceived as act of protest against nuclear weapons, the artistic direction proved highly productive for him and led to him produced numerous works in this fashion as well as well as later works that were simultaneously Auto-Destructive and Auto-Creative, an example being his Liquid Crystal Light Projections that create a new form through the destruction of a previous one.